There's a place more than 500 kilometers above the Atlantic Ocean where space station computers suddenly crash, space telescopes can't operate and satellites shutdown. Some people call this zone the "Bermuda Triangle of Space." Because of its shape, some researchers nicknamed it "the Duck." However there's nothing really mysterious about the South Atlantic Anomaly. 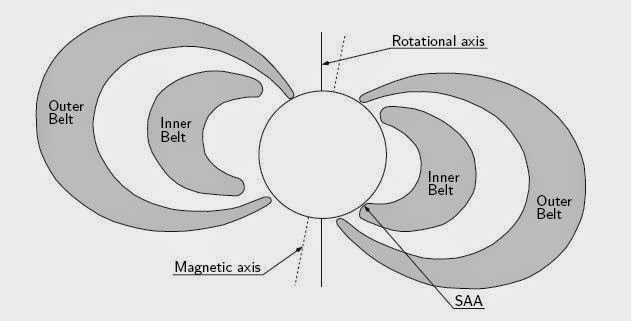 It's a region of space where the Earth's magnetic field is off center and lets in space radiation to especially low altitudes. Now a team of Italian researchers have re-crunched the data from a decade-old satellite to get a clearer picture of this space hazard. The anomaly is part of the Van Allen Radiation Belts, a ring of trapped solar radiation between about 1,000 and 6,000 kilometers above the planet's surface (there's a second ring that starts about 13,000 kilometers out). However the rings are a little bit off-kilter because the middle of Earth's magnetic field doesn't align straight through the center of the Earth. That brings one sliver of the ring closer to the planet's surface, centered off the coast of Brazil. The Italian researchers scoured archived radiation data from the BeppoSAX satellite that flew from 1996 through 2003. The satellite carried with it a particle monitor which recorded whenever it flew through a cloud of high-energy protons and electrons like the SAA. Using this data, scientists were able to build a clearer picture of this radiation zone, or at least the northernmost section of it which the satellite passed through. The results yielded no big surprises from past studies, but offers a detailed picture of whats happening in Earth's magnetosphere. Instruments on the satellite registered as much as a fifty-fold radiation increase inside the SAA but surprisingly, radiation seemed to drop off somewhat when the sun was at its most active. The researchers think this is because when the sun is the most active, it heats the Earth's upper atmosphere, making it difficult to absorb cosmic rays. Over the six years BeppoSAX collected data, the satellite was slowly dropping lower in the sky, so it could map the anomaly in three dimensions. The particle counts dropped off precipitously starting around 550 kilometers up, and was barely detectable below about 520 kilometers. The team also saw the SAA slowly creeping westward. Each year it edges about 34 kilometers closer to Africa, meaning that sometime around 2114 it will be centered over the coast of Namibia. Though the tilt brings the band of radiation abnormally close to the Earth, it's not a threat to people living down on terra firma. The atmosphere filters most of the radiation out and anything below about 200 kilometers is no different than anywhere else on Earth. However it is a concern for satellites and astronauts in low Earth orbit. The International Space Station, the Hubble Space Telescope and countless other satellites pass right through it, sometimes several times a day. 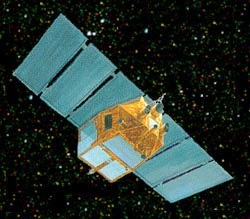 The Hubble has to turn its sensitive detectors off while passing through and in 2010 the radiation levels overloaded an Air Force Space Based Surveillance Satellite, rendering several of its instruments inoperable. The anomaly was discovered in 1958 along with the Van Allen belts. Scientists at NASA quickly realized that the longer astronauts stayed in space, the more they would be bathed in this radiation. 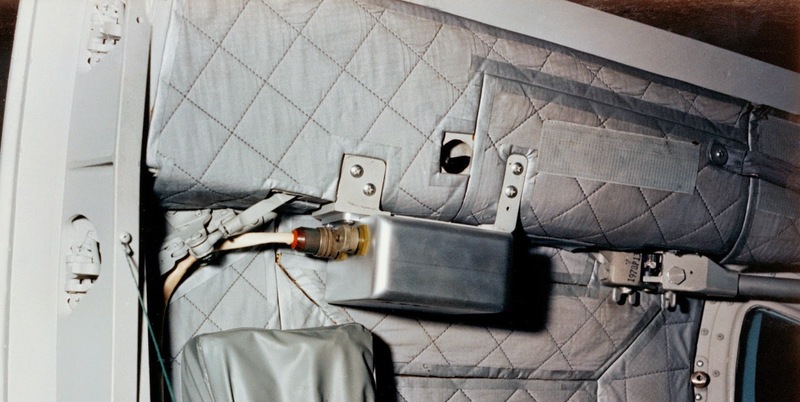 They installed radiation counters inside the cabins of several Gemini spacecraft that flew through the region multiple times. NASA followed up these experiments with a bevy of satellites and small rockets sent up to penetrate and map the Van Allen belts. In 1968, NASA launched the South Atlantic Anomaly Probe from Natal, Brazil to fly through and evaluate the radiation levels inside the SAA. 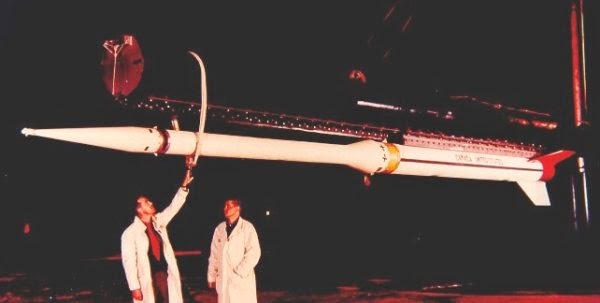 The rocket carried with it three experiments to measure how much radiation there was up there and how much the shielding of the Apollo command and lunar modules would protect the astronauts inside. The experiments showed that the radiation levels didn't pose any significant danger to astronauts and equipment that flew through it. But in recent years, as electronics have shrunk down and sensors grew more sensitive, the radiation has started causing more and more problems. Laptop computers on board the International Space Station are prone to crash while passing through the radiation zone. With the possibility of a manned Mars mission in the coming decades, these experiments are more relevant than ever. On years-long flights to our cosmic neighbors, astronauts would be exposed to interplanetary radiation levels for long periods of time. What effect this would have on crew and equipment is still somewhat unclear, but its something that NASA is seriously studying. I have lived all over the planet at different latitudes and altitudes for long periods of time in each. I spend a lot of time in the sun. There is a different quality to the sunlight on the southern Brazilian coast than anywhere else I've experienced. The effect on the skin is a deeper, darker tan that there's no apparent reason for compared with other locations, all factors considered. This is even on clear days with no aerial spraying. This might explain why.
" NASA's Unexplained Files "
It was all about the Bermuda triangle of space. NASA is trying to find out what makes this region of space so different then other regions of space.